That kind of play probably alienates a lot of people in this Type A town. I’m going to go out on a limb here and say I could care less if a barista won’t make you an iced espresso*. My addiction is specific. Hot espresso, frothed milk, warm china. Cappuccino or mocha, depending on my mood. Because my desires are so simple, the ingredients take on vital importance. Each element has to be perfect. Is that annoying? Oh yes, I wish it weren’t so. Starbucks rips my stomach up, Caribou leaves me lifeless. The coffee needs to be good, real good. 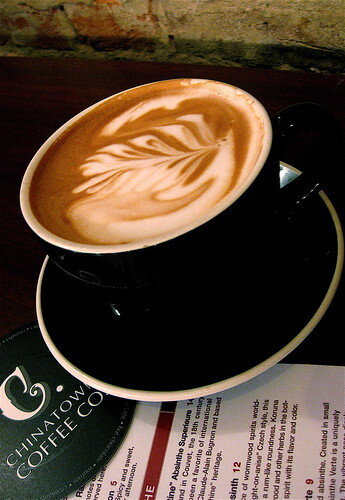 Chinatown Coffee Company serves some of the best going – Counter Culture, Intelligentsia and Novo. The minute you walk in you’re hit with the fine scent of those premium roasts – chocolate, almonds, hazelnuts, vanilla – it’s an instant feeling of warmth and comfort for me. They get their milk from Trickling Springs (wait, didn’t I just try their yogurt? Outstanding. Quality of milk really makes a difference!). I dream about their Black Cat espresso, it’s so amazingly balanced and smooth it almost reminds me of a damn fine scotch. The hit from that carries me through the rest of the day, something I just don’t get from chain coffee. If espresso drinks aren’t your thing, you can get you coffee by other methods – drip, french press or even Abid hand pour. The Abid hand pour method is fascinating to watch. It uses a funny contraption called the Clever Coffee Dripper that brews about 10 ounces in a controlled extraction time, so you get a clean cup with no sediment. Once you’re done with your coffee, you can move on to drinks! Somehow it seems appropriate to serve absinthe in a place where people are hanging out working on their theses, after all it used to be an integral part of cafe culture. You can sip three kinds here – Artemisia-Bugnon Distillery’s “La Clandestine,” Koruna Bohemian Absinth, or Obsello Absinthe Verte. Broken up with the green fairy? I hear you. There’s beer and wine too, from everyone’s current favorite Bell’s Oberon 5 to Bodega Baudron’s Black Reserve Malbec, prices ranging from $4 to $12 a glass. Of course you could also while away the hours with cups of tea, too. Whiling away hours is something many people do at CCC (open from 7am to 8pm on the weekdays, 8am to 7pm on the weekends). It’s a pretty minimal space, a long room set off by exposed brick, with basic furniture and funky music. There’s always an interesting conversation to eavesdrop on as people work or chat or the baristas debate the finer methods of the pour. I really enjoy spots like this – simply providing high quality product in a utilitarian atmosphere that still manages to sport its own personality. There’s something so beautiful and distinctly American about the desire to brew a better cup of coffee. Only a few years ago I had to beg to get my java fix in a china cup. Now, more and more places are seeing the value in serving perfectly crafted coffee and espresso drinks. Warming my hands around the porcelain, staring at the milk froth pattern, inhaling that distinctive roasted aroma – it may seem silly, but it’s precious to me. It’s one of the few moments I stop thinking and worrying and just… sigh. Chinatown Coffee Company is located at 475 H Street NW, Washington, DC 20001. Closest Metro stop: Gallery Place/Chinatown (Red/Yellow/Green lines). For more information call 202-559-7656.